The terms “decore” and “shake out” cover the removal of the core and core residue, including the core bar (densener) from the casting. The decoring is usually carried out by machine, whereby the steps are subdivided into pre-decoring and the actual decoring and shaking out. In principle, the core is broken by introducing impact energy (using a hammer or vibration/swinging energy) and the broken mold material can trickle out of the core holes of the casting - often aided by a simultaneous turning movement. The casting is placed on the table top. The hammers are positioned over the casting (Figure 1). 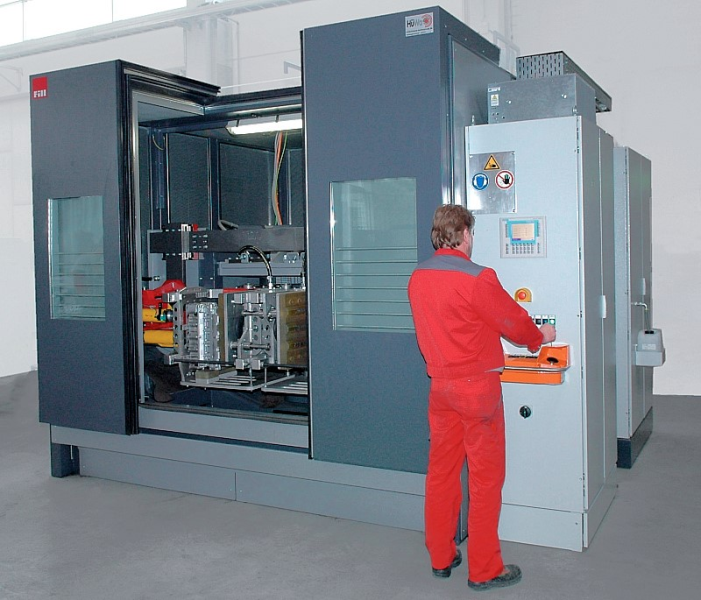 Depending on the weight of the component and the feed process, the hammers can be positioned variably and also pulled up while castings are being changed. They can be changed over quickly and easily. The amount of time for which the hammers strike can be programmed as desired using the control system or a pneumatic control valve. The accumulating sand is discarded below in a targeted manner. Figure 2 shows a hammer machine for pre-decoring. 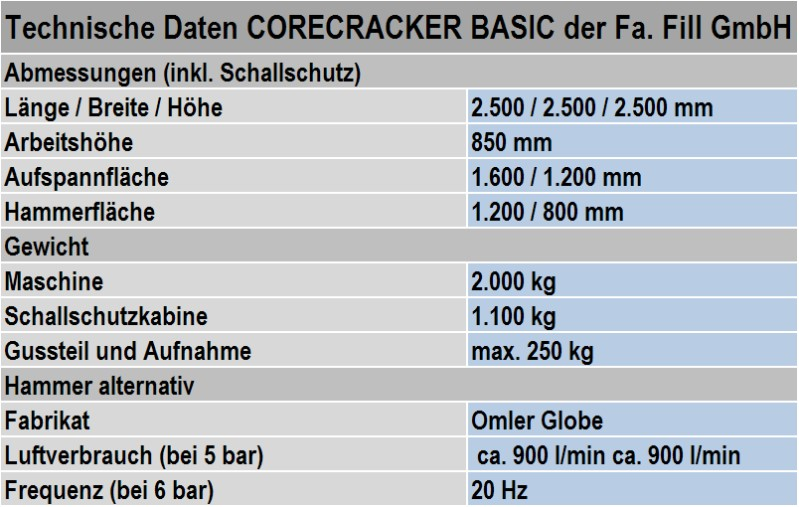 In the design shown (CORECRACKER BASIC from the company Fill GmbH, technical data in Table 1), a solid steel plate construction of a table and hammer attachments ensures the required robustness of the plant. Flexibility is enabled by the adjustment of the hammers in the X, Y and Z direction; it is also possible to operate one or several hammers. In the swinging principle, extremely powerful unbalance shafts create a force in the swinging direction. The castingclamping device is displaced by this. The previously broken sand core on the inside of the casting is pulverized and crushed by extreme accelerations and transported to the outside. 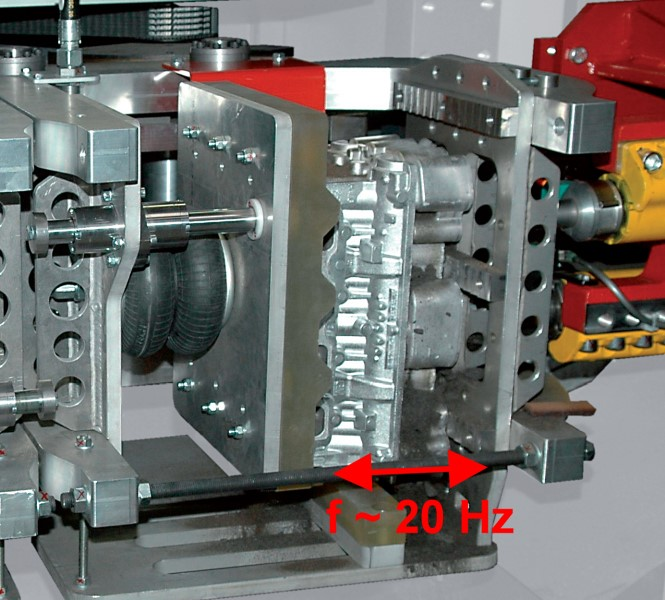 Through the rotating unbalance shafts, acceleration values of over 450m/s² can be reached in the casting (depending on the load). A servo swivel unit puts the casting in the best position for sand to be transported out of it. This allows minimum sand residues in the casting to be achieved with high process reliability. In addition, compressed air can be blown into the inside of the casting in order to reduce the amount of sand residue even further. An example design can be seen in Figure 3. 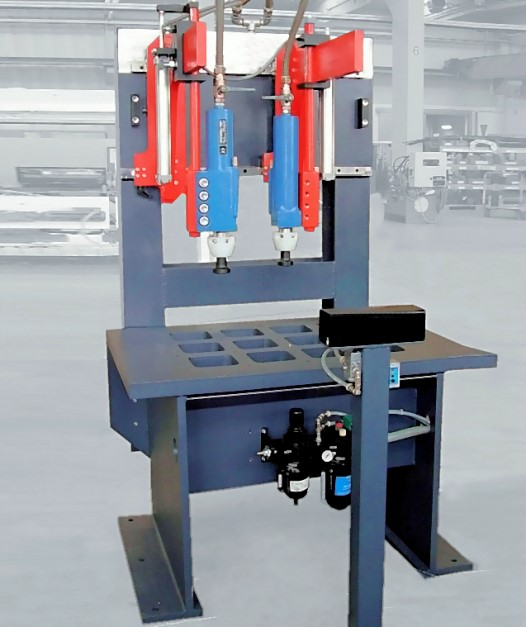 The machine shown can be used as an individual machine with a hammer modulus or operated in connection with several machines and a separate hammer station as required. The maximum load, i.e. 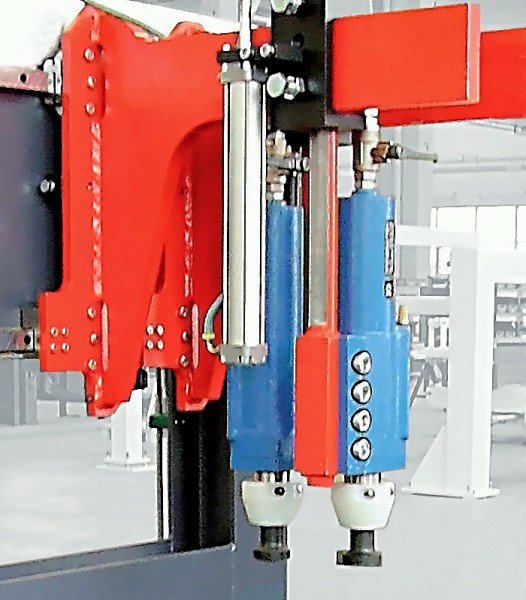 the casting with clamping device, is 315kg, making it possible to decore several castings at the same time (Figure 4). The technical data of the swinging decoring plant, type SWINGMASTER 315 from the manufacturerFill GmbH, is given in Table 2. If the casting does not need to be rotated, a swinging decoring machine without rotating movement can also be used, as depicted in Figure 5, for example. Here too, two powerful unbalance shafts create a swinging motion which sets the casting in motion (Figure 6). Due to the accelerations which act on the mold material, the previously broken sand core inside the casting is crushed and transported to the outside. 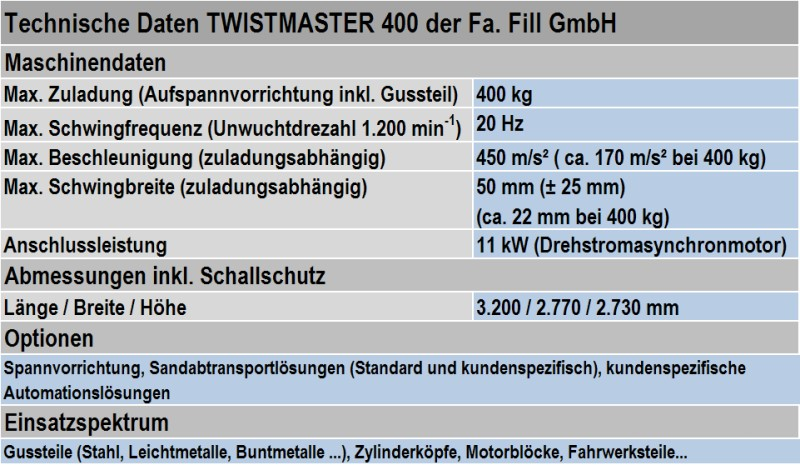 Acceleration values of over 170m/s² for loads of 400kg are possible and guarantee minimum cycle times and the high efficiency (technical data for such a plant are given in Table 3). This construction can be used as an individual machine with hammers or in conjunction with several machines and a separate hammer station.